This is one of my family’s absolute favorite meals! 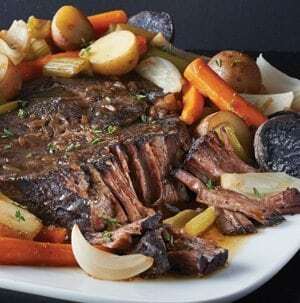 My preferred cuts for pot roast are either chuck roast or brisket. Run the pot roast under cold water and then lightly coat it in flour. In a large skillet / frying pan, saute garlic in olive oil and butter, then turn up the heat and sear the pot roast in this just enough to brown the outside of the roast. Place the roast in a large covered roasting pan. Quarter 3-4 large onions and place around the outside of the meat. Clean peal and cut, and then slice in half length ways a good quantity of carrots and also place around the outside of the pan. On top of the meat, spread the package of Lipton’s Beefy Onion Soup Mix (or Onion Soup Mix if don’t have the “Beefy” variety). Also on top of the meat sprinkle a modest amount of Melinda’s Extra Hot Sauce or another hot sauce you like. Measure out about .4 cups of a substantial red wine like Bordeaux and add a little water to bring the quantity up to 2/3 of a cup and dump this around the outside edge of the meat (the point is to not dump it on top of the meat washing off the soup mix). Cover and place in oven at 275 degrees. I usually cook a 3-4 pound pot roast for about 3-4 hours. Slice the roast into strips as you serve it. For a hearty meal, serve with old fashioned, broad flat noodles on the side. Notes: If you don’t finish it all, while the meat is still warm, slice the rest of the meat and place in a ceramic pot, pouring the gravy on top the meat. It will be even better the second day!